And here is Phil’s latest photomosaic reprojected into the improved DLR shape model. I have no idea what DLR means, but I can sure locate it onto the latitude longitude grid. Some features move as much as 15 degrees! Click on image to enlarge. Here is a wonderful — and illustrated — article on assembling this map. I first learnt about this site of yours thanks to the link you shared at the papermodelers.com forum. This Phobos is really tempting me. Very interesting things you have in this place. I’m enjoying to discover so many new things that I didn’t know, and a lot of things that I already knew but presented under a new and different light. This is an excellent map for the novice folder. Look above in the post; I added a link to a very helpful article on how to assemble this map. I finished this a while ago, but I hadn’t shared it. Thank you very much for this interesting model. It was very nice to build it. 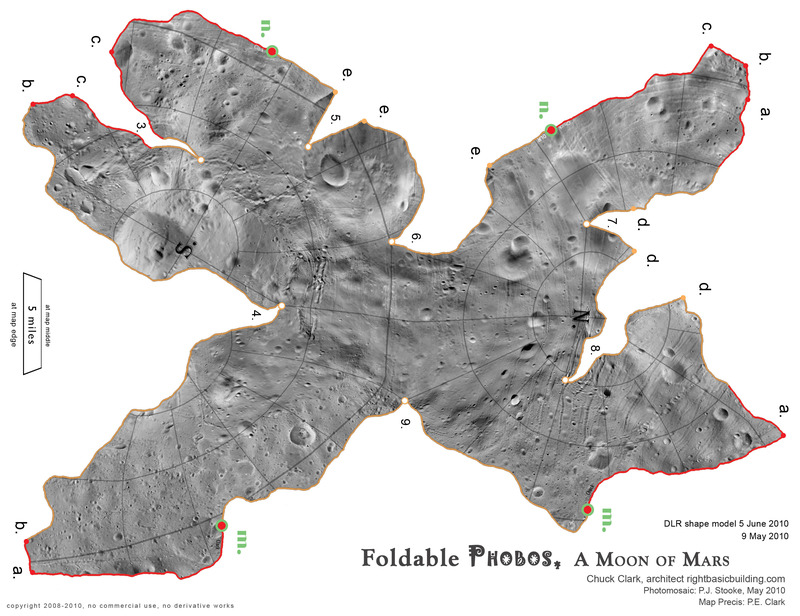 Hi Chuck , i just finished this DLR Phobos map ,it is very interesting though a bit harder than Deimos, i got the two made. How about a Deimos DLR with enhanced surface ? like this Phobos, the original Deimos lack a bit of details. I used 2 A4 120g bond sheets per map ,gluing in them the center and for Deimos the scale was 1/111000 , the newer Phobos is 1/175000, i’d like a new Deimos at this later scale. I’m evaluating Eros as next project. Patience on an improved Deimos. It is in the works. Check back later this summer.